The Today show celebrated Halloween this morning (Oct. 31) in country fashion, with appearances by the real Reba McEntire, Blake Shelton, Shania Twain, Dolly Parton and Billy Ray Cyrus. In front of a Grand Ole Opry backdrop, McEntire announced Today hosts one by one as they revealed their costumes with performances from country stars. Al Roker did his best at Willie Nelson. 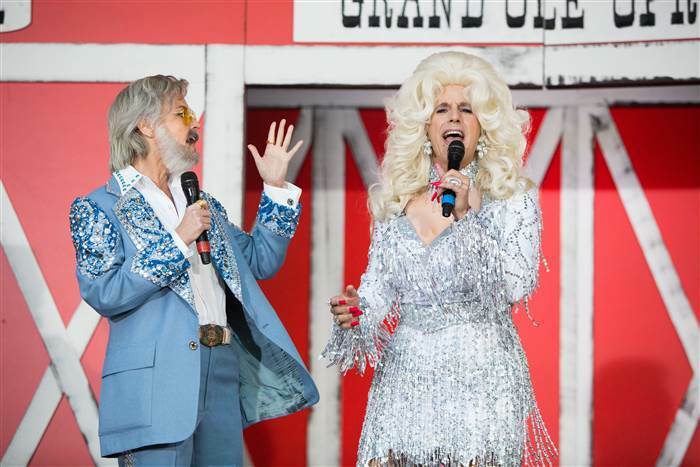 Savannah Guthrie and Matt Lauer portrayed gender swaps for a rendition of Kenny Rogers and Dolly Parton’s “Islands In The Stream,” respectively. Parton herself gave Lauer costume advice in a particular, presumably pre-recorded video segment. But it was not only Carson Daly‘s version of Billy Ray Cyrus who surprised viewers with an appearance alongside the real country star Cyrus, but Hoda Kotb‘s portrayal of Blake Shelton was also joined by the Warner Music Nashville star. Megyn Kelly‘s version of Shania Twain was surprised later in the morning by the country legend. Twain joined Kelly on her own show later in the day as well as the rest of the costumed hosts. Kathy Lee Gifford made an effort at another Nashville darling, Miley Cyrus.